DAYS OF JESSE JAMES (1939, Republic) Roy Rogers, Gabby Hayes, Donald "Red" Barry, Pauline Moore, Harry Woods. Gabby deposits his gold earnings into the bank. Shortly afterward, the infamous James Brothers rob the bank. Or is it? Roy and Gabby try to figure out the mystery in this highly enjoyable Republic western. From 16mm. RIDIN’ DOWN THE CANYON (1942, Republic) Roy Rogers, Gabby Hayes, Pat Brady, Linda Hayes. Horses destined for the war effort are being targeted by unpatriotic thieves, who then try to sell them to the government themselves. Roy and his buddies come in to put things in the proper order. 16mm. 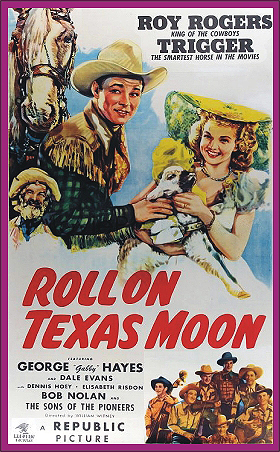 ROLL ON TEXAS MOON (1946, Republic, Uncut!) Roy Rogers, Dale Evans, Gabby Hayes, Bob Nolan. Uncut! The first of 27 Rogers films directed by Bill Witney, who brought in more action and livelier pacing in favor of songs & gaudy costumes. There’s a bloody dispute between cattlemen and sheepmen. It’s up to Roy and the boys to prevent an all-out range war. Recommended. 35mm. THE GAY RANCHERO (1948, Republic, in color!) Roy Rogers, Tito Guizar, Jane Frazee, Andy Divine, Estelita Rodriguez, Leroy Mason. Roy is out to stop a gang of airplane saboteurs, trying to gain control of an airport south of the border. The action is strong and a bit bloody at times. Watch for the surprising scene where Roy gets the you-know-what kicked out of him. Rodriguez is a true Hispanic beauty and almost steals the movie with her effervescent performance. 16mm.